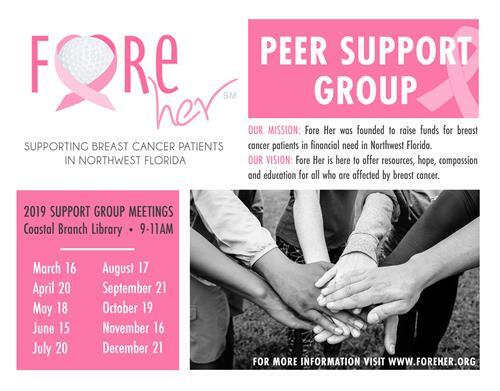 Santa Rosa Beach––Fore Her, a local non-profit organization helping women battling breast cancer, has launched a breast cancer peer support group. The group will meet on the third Saturday of each month at the Coastal Branch Library in Santa Rosa Beach. The first meeting will take place on Saturday, March 16 at 9 a.m. The group was created to provide a safe space for women to discuss their experiences and needs while also providing connections to local resources. The group is open to those currently undergoing treatment and survivors of breast cancer. Fore Her is a 501(c)3 organization that was started in memory of Founder Amy Walsh’s mother and aunt, who both lost their battles with breast cancer. The Santa Rosa Beach based non-profit works to financially assist local women battling breast cancer, allowing them to use the money in any way they need––whether that’s paying the mortgage or buying groceries. See attached for Press Release in PDF Format, Peer Support Group Graphic, and a picture of the Fore Her Board. We hope you will help us spread the word about this amazing new resource in our community.